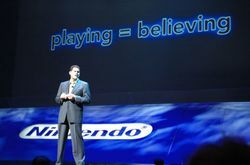 What’s Your Dream Game Announcement for a Nintendo Platform at E3 2011? I was originally going to ask what your dream announcement from Nintendo would be, but the obvious answer is “Wii 2”, of which we already know is getting shown off. What we would rather see is what sort of previously unannounced game would you like to see appear at E3 2011 for a Nintendo platform. This doesn’t need to “just be a Nintendo game”, cross platform announcements are welcome as well. Think, in that case, of games like GTA 5, or maybe L.A. Noire slated to release on the Wii 2 next year. Maybe it’s an all new unexpected title. Could we have a new Starfox game for Cafe? What about Pikmin for the 3DS? There are so many possibilities that coming up with a dream game can be hard. Most of us may say a Zelda game for Wii 2 or the 3DS, and that is completely valid. After all, this a “dream” right? Personally, I would like to see a new Earthbound game, exclusive to really any Nintendo platform. It’s hard to really know what we’re going to see, but in a perfect world Earthbound makes a triumphant return. Oh, and if I count remakes… how about Secret of Mana brought into full 3D? What would you like to see?